Spectra Precision's MobileMapper 300 smart antenna and DigiTerra Explorer v7, one of Europe’s leading GIS software solutions for mobile mapping, now interface seamlessly. This new interface enables the DigiTerra Explorer to drive the MobileMapper 300 directly. 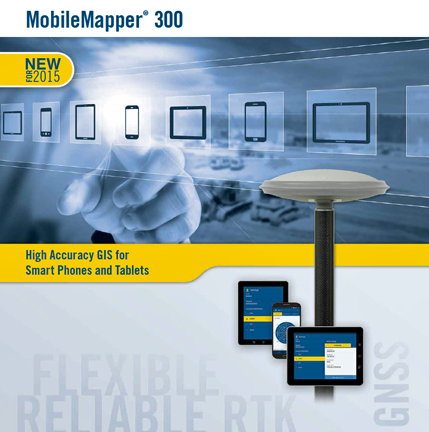 The MobileMapper 300 is a professional-grade GNSS receiver with advanced accuracy options that are scalable from mapping grade to full RTK accuracy, including RangePoint RTX over IP support and is designed for use in combination with a wide variety of mobile devices, including smart phones, tablets, and notebook computers. DigiTerra Explorer offers mobile mapping, GIS data collection and maintenance as well as field-to-office workflow solutions. The software enjoys a significant share of the GIS forestry and agriculture markets in Europe, and it is rapidly expanding into a wide variety of vertical markets and into North America.